Smelling a ripe peach immediately brings to mind several food memories: summers on my parents' deck, eating the fruit as quickly as I could as it leaked all over my arm. Family beach trips to South Carolina and finishing dinner with a peach. And most recently, our trip to Fishfill Farms, on an especially hot August day, to go peach-picking. The trees were laden down with peaches that day; we could have easily filled our buckets in under 5 minutes, returned to our car, and driven away. But we wanted to linger a bit and savor being on the farm (despite the bees!) so we wandered from tree-to-tree, picking only the most perfectly shaped and ripe fruit, trying to slow things down. When we got home that late summer day, after parking our Zipcar two miles away and walking slowly back to our apartment, cradling the buckets of peaches, I quickly separated the most ripe and slightly bruised peaches into a pile for immediate consumption. I then blanched the remaining peaches long enough to remove their skins, before cutting and freezing the slices into gallon-sized freezer bags. 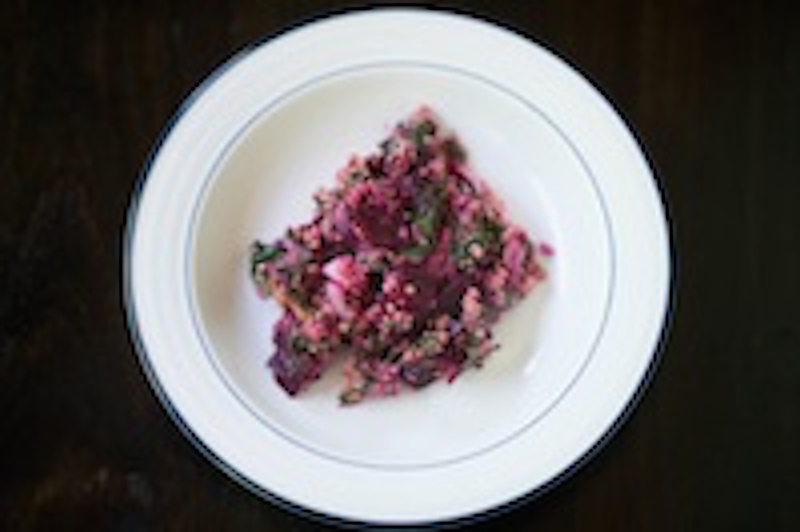 As we rapidly approach our move date, my meal planning is now structured around items in our freezer and pantry that we can't take with us (such as flour, quinoa, and way too many red lentils). I hadn't forgotten about these frozen peaches; I was waiting to find a recipe that would easily incorporate the slices without feeling too forced. If you're interested in baking with different kinds of grains and flours and really understanding the differences between these grains, you'll find no better resource than Kim Boyce's Good to the Grain. Boyce is the former pastry chef at Spago and Campanile. As an exciting sidenote, she and her family recently moved to Portland where she opened up a bakery called Bakeshop. I've now baked four recipes from this cookbook, including some stellar carrot muffins, and while it's an ongoing process and one I hope to concentrate on more fully once we move, I am slowly gaining a better understanding of different grains' textures and consistencies. I've made Boyce's recipe for Ginger Peach Muffins twice. The muffins contain all-purpose flour, whole grain flour, and oat flour. She describes oat flour as having a mild, milky taste that pairs well with fruits and chocolate. Oat flour is ground from the kernels of oats and doesn't contain gluten. 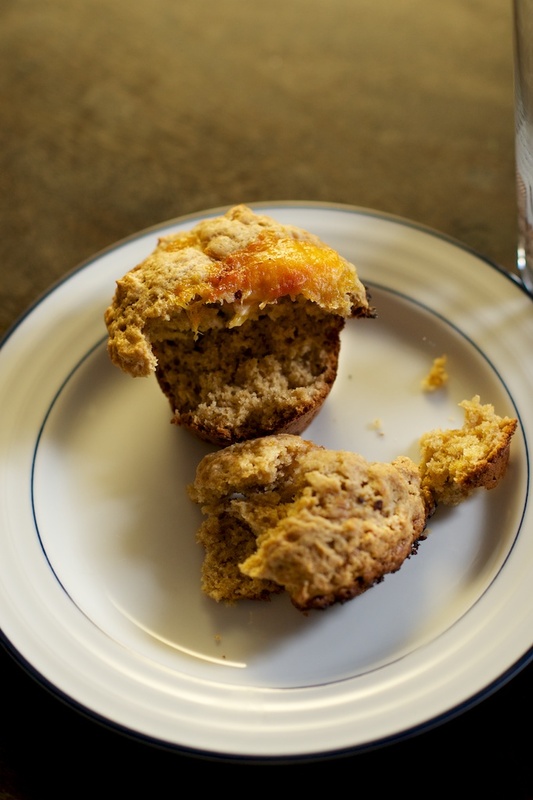 Because of this, her recipe mixes in all-purpose and whole wheat, to add structure to the muffins and avoid gumminess. If you don't have access to oat flour, you can make your own by processing rolled oats in a food processor. 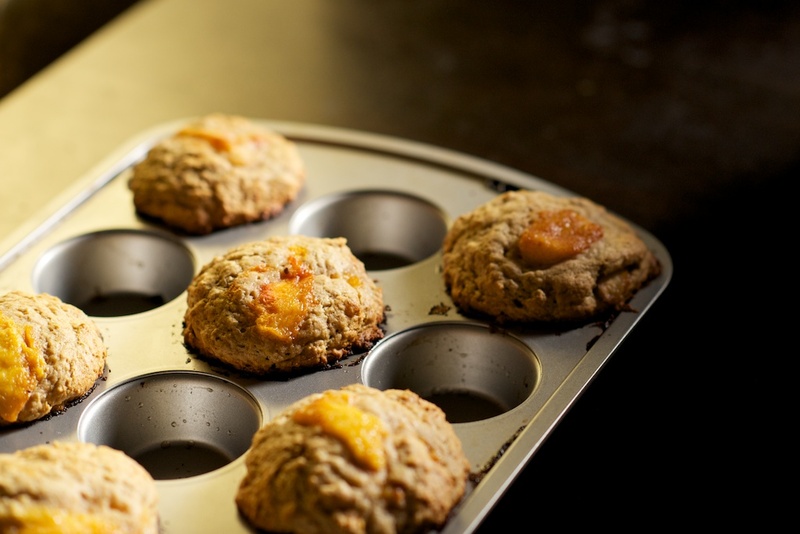 These muffins combine two of my favorite flavors, ginger and peaches. The process is straightforward and contained. You'll need a bowl for wet ingredients, a bowl for dry, and a sautee pan for the peaches. 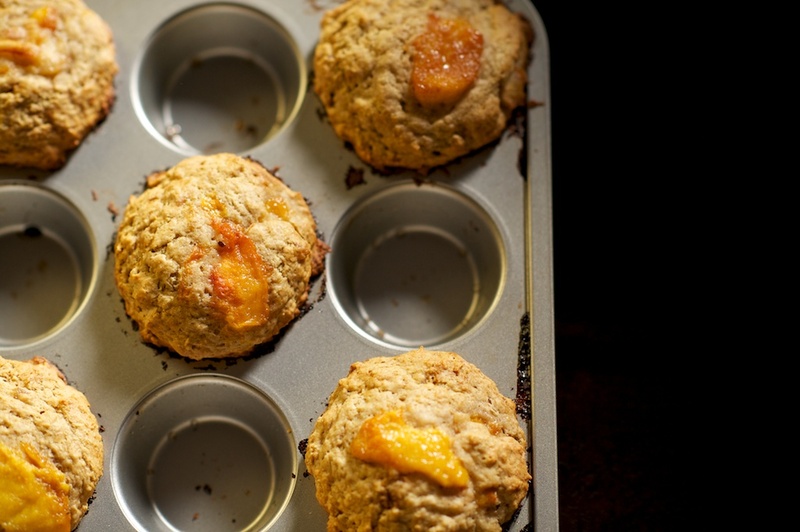 As for the peaches, if you didn't freeze any this past summer, you can certainly bake these muffins with frozen peaches from the grocrey store. Or, wait until peach season, and bake these with a perfectly ripe peach! 1. Preheat oven to 350 degrees. Rub muffin tins with a bit of butter. 2. Melt the butter for the wet mix and set aside to cool. 3. Prepare the dry mix: Sift the dry ingredients into a large bowl, pouring any grain that might remain in the sifter back into the bowl. If you don't have a sifter, use a spatula to gently stir the mixture, breaking up the clumps. 4. Prepare the topping: if using ripe peaches, halve the peaches, remove the pits, and slice into 1/4 inch thick slices. 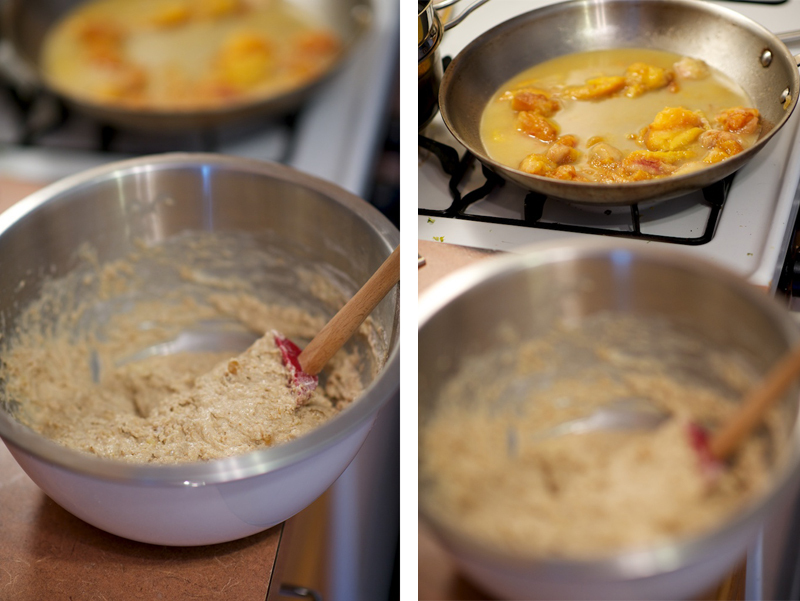 Add the butter, honey, and if you want, a bit of crystallized ginger into a skillet. Place the skillet over medium heat to melt the mixture, stirring to combine. When the syrup begins to bubble, add the peaches and toss to coat. If using frozen peaches, prepare the syrup in the same way. When adding the peaches, toss to coat, and keep tossing until the peaches become soft. 5. Prepare the wet mix: Add the ingredients to a medium sized bowl and whisk until combined. 6. 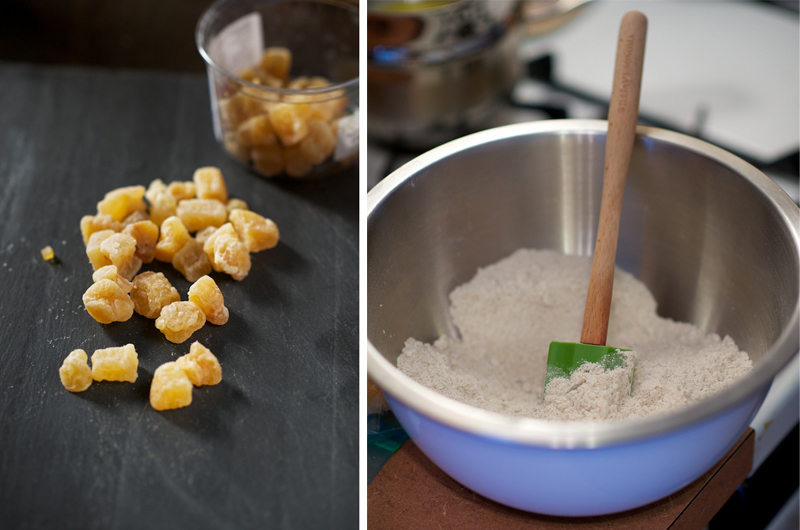 Combine: Using a spatula, mix the wet ingredients into the dry ingredients and gently combine. 7. Scoop the batter into 8-9 muffin cups, mounding the batter over the edge. Toss the pan of peaches to recoat them with the juices. 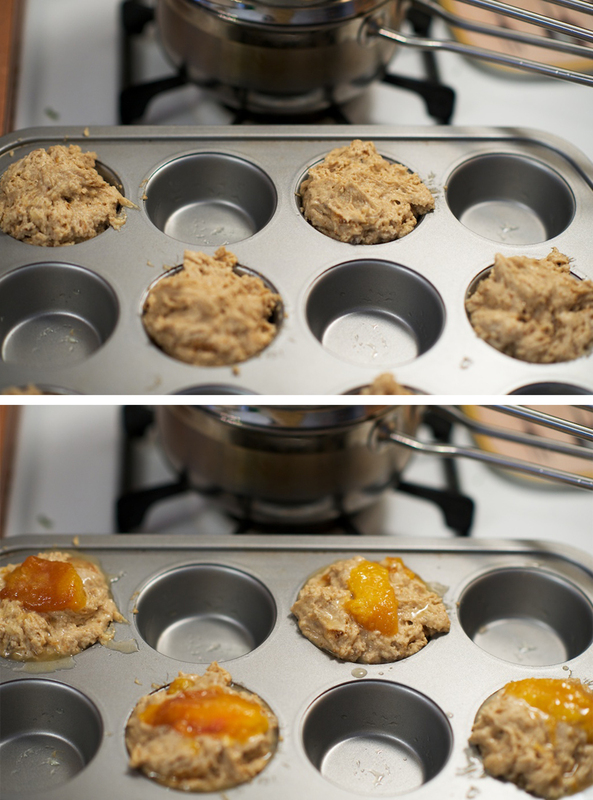 Tuck one slice of peach into the each muffin and lay a second peach on top of each muffin. You can save any extra peaches for use over ice cream or yogurt. 8. Bake for 24-28 minutes, rotating halfway through. The muffins are ready when they smell nutty, their bottoms are golden (you can carefully twist one to check), and the edges of the peaches have started to caramelize. Remove the tin from the oven, twist each muffin out, and lay it on its side to cool in the cup. This will ensure the muffins stay crusty, not soggy. Eat these muffins within two days for optimal flavor. Enjoy!